Wow. Heidi Hart has such a deep relationship with everything she encounters and she takes the reader along in her journey. One of the most amazing experiences I had while reading this book was in a passage where she described music. I don't know a lot about music. But while I read, I could clearly hear my favorite piece of instrumental music playing in my head. To be so evocative is a feat in and of itself. But she doesn't limit herself to just music. Exquisite in both its detail and its structure, the journey weaves music, poetry, religion, and relationships into a vessel of discovery. When I wasn't reading this, I wanted to be; when I finished, I wanted to study it again. How often is a memoir that rich? It was refreshing to encounter a memoir of someone who had left the Mormon faith, but who had not abandoned her spirituality. So often, I meet people filled with rancor for the experiences they have in the Mormon church. There was none of that in this memoir. Instead, Hart finds her voice, both literally and figuratively, in her singing and in her conversion to Quakerism. Her memoir is structured with repeated phrases as though it were a complex song. 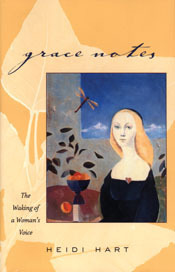 Each chapter had the subheadings: diary, nine openings, chant, passagio, conversation, and silence. The diary helped ground me in her current soulful search, awash with details that makes it feel as though she is writing down what she is simultaneously experiencing. Nine openings refers to the nine openings of the human body, a sensory and bodily engagement with the world, but also Rumi's comparison of the body to "a reed flute torn from the reedbed." Passagio is a musical term for notes where your voice breaks, but also can be seen as a pivot point in your range if you embrace the passagio. These passages were encounters with music, but also pivot points in Hart's life. Chant and conversation both engaged with other traditions such as Mormonism, monasteries, Zuni mythology, or even African-based dancing. Silence represented her encounters with Quakerism. In its detail Hart hits a lot of staccato notes with her fragmented sentences that resonate deeply. In one of my favorite parts, she is performing a tonglen Buddhist meditation with her mother. She describes her thoughts as she inhales the pain and then releases it on the exhale. "I breathe in. Fjord, stone tunnel, train, bodies crushed together in artificial light. I breathe out. Sunlight on the water. I breathe in. Despair. I breathe out. Hope." I highly recommend this for anyone on a journey of self-discovery or anyone who appreciates craft.